Here is who will visit USC this weekend (officially and unofficially): Cornerback Julius Irvin (Servite); linebacker Solomon Tuliaupupu (Mater Dei); quarterback JT Daniels (Mater Dei) and wide receiver Amon-Ra St. Brown (Mater Dei). 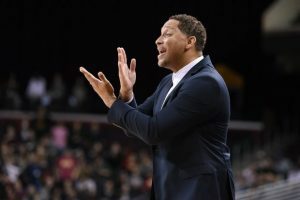 USC says assistant basketball coach Tony Bland is no longer employed by the school. Why now all of a sudden? It seems reactionary especially after Arizona fired assistant coach Book Richardson earlier this week. Or did the feds happen to give the schools more information? The USC-UCLA game on Feb. 3 at Pauley Pavilion will be at 3 p.m. on ESPN2. With no running backs coach, USC is short when it comes to total number of people available to recruit and make home visits. So USC has activated one of its support staff members to replace Deland McCullough as a recruiter. Former USC athletic director Pat Haden activated himself four years ago as a recruiter when there were coaching vacancies. Remember he famously offered a basketball scholarship to the sister of defensive tackle Eddie Vanderdoes, who ended up at UCLA. USC led by 15 points at halftime then held on for a five-point victory over Stanford as Jonah Mathews scored 18 points with four 3-pointers.Chimezie Metu added 12 points and 10 rebounds. Stanford actually cut the lead to 66-64 with 32 seconds remaining. Bennie Boatwright did not play because of a “plantar wart” on his foot. The crowd: It was announced as:4,116. What kind of crowd will USC get for a 6 p.m. game at the Galen Center vs. Stanford? The Trojans have won 9 of 11 games. The crowd for this game would be bigger if the game were determined by a halfcourt shot like the meeting at Palo Alto. 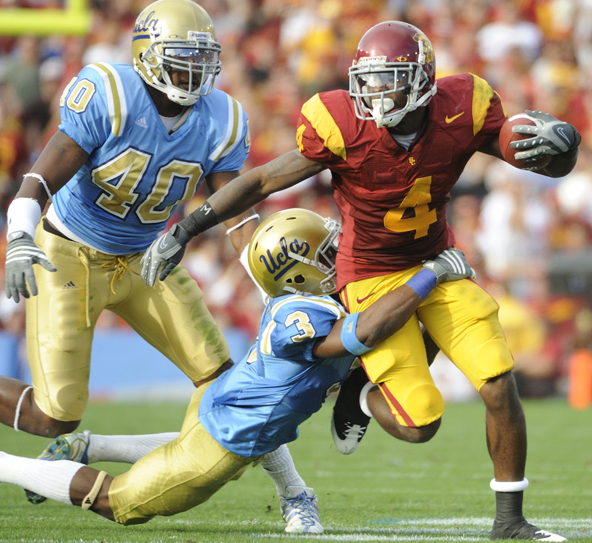 Wide receiver Rahshead Johnson spent a season at USC under Steve Sarkisian before he transferred to San Jose State. Johnson has now left San Jose State but could go to an FBS school as a graduate transfer.